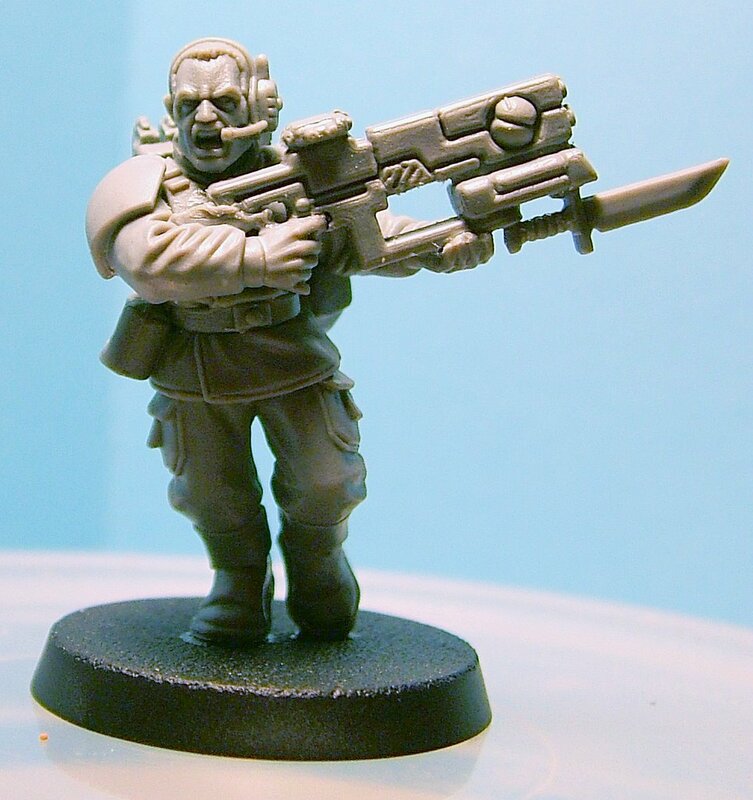 The next big alien allies group for Tau is the Gue'vesa or expatriate humans. The Gue’vesa, literally ‘human helpers’ in the Tau tongue, are human warriors who have taken up the cause of the Greater Good as their own. These humans, often the descendents of troops captured or abandoned during the abortive Damocles Crusade, now live and fight alongside the Tau. For them, fate has dictated that the Imperial Creed and the rule of the Adeptus Terra be replaced by loyalty to the collectivist Tau Empire and to the ruling Ethereal caste. Imagine that, humans working for the Greater Good... intriguing, isn't it? Ok, so there are two paths you can take for modeling Gue'vesa: the strictures dictated by the data sheet or as members of fire warrior-like squads. 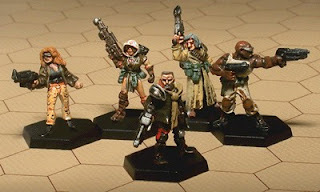 The standard military squad of these outcast humans consists of 6-12 humans carrying lasguns best portrayed by models from the Imperial Guard or Necromunda range. Basically they have a standard Tau statline except for slightly bumped weapons skill and initiative of 3. Two of them can carry pulse rifles, and their team leader is elgible for a markerlight. They can also take EMP grenades just like firewarriors, and they cost 6 points apiece. Downside? Again, IG armies get significant bonuses against them in close combat. These are apocalypse units from the previous version, so you need consent from your opponent to field units of these guys like this. You can also field squads called mining work gangs. These gangs consist of a gang leader, 5 to 18 miners, and an optional ogryn. Their weapons consist of various pistols, close combat weapons (picks, crowbars, and hammers) and the ogryn carries a club. The gang can carry one las-cutter (melta) one demolition charge, and one lasgun or shotgun. Oh, and there are no armor saves. Period. Essentially, these guys are little more than armed thugs, but they are effectively statline Tau, only 5 points each, and a troops choice so they can hold an objective --maybe. Again, be sure to talk to your opponent about using them. I tell you this not to be sneaky or weird, I just really get into the fluff and I really like customizing the models. 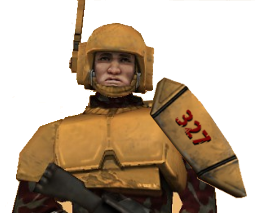 The same five fire warrior poses 80 times got to be a pain, so I mixed in a little Cadian. You may not like the idea, and that's perfectly ok -don't model them. This guy over on ATT made a synthesis prototype from cadian and Tau helmets and cast his own. And while they look awesome, I can't do my own casting... yet (learning it though). I say "this guy" but his name is Seb and I think he goes by Shas'o Tael on ATT... He was actually featured for his models in White Dwarf. Here is a link to his site, if you're interested. That said, there are tons of ways to model these guys, give it a shot and tell us about it. I hope you have as much fun with this as I have.